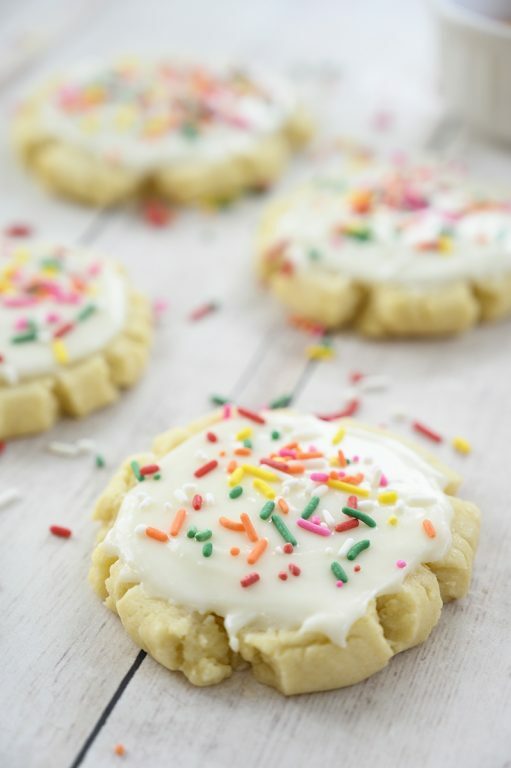 The best Copycat Frosted Swig Sugar Cookies recipe – no chilling the dough, rolling out the dough, or cutting them out with cookie cutters! These frosted cookies are so soft, buttery, and so tasty! 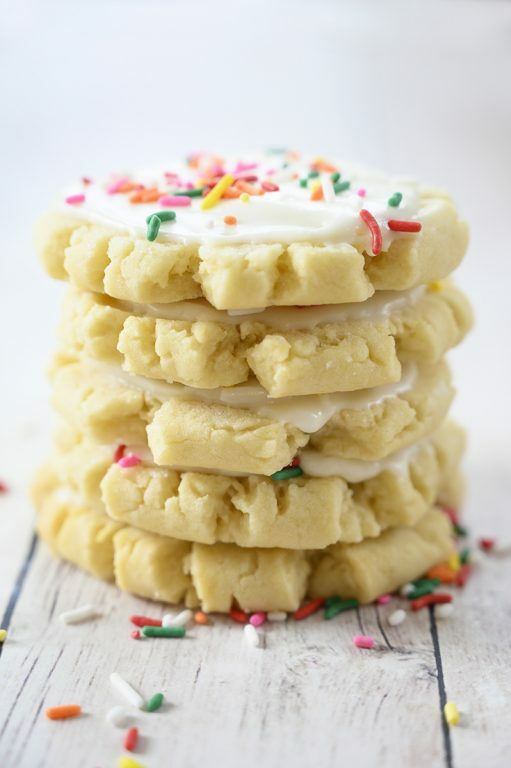 Having an amazing sugar cookie recipe in your back pocket is the key to a happy life – I am sure of it. I have made so many sugar cookies in the past. The various Swig sugar cookies recipes always caught my eye when I saw them floating around on Pinterest or Facebook. I knew for years that I wanted to try them and all I can say is, I wish I tried them sooner. 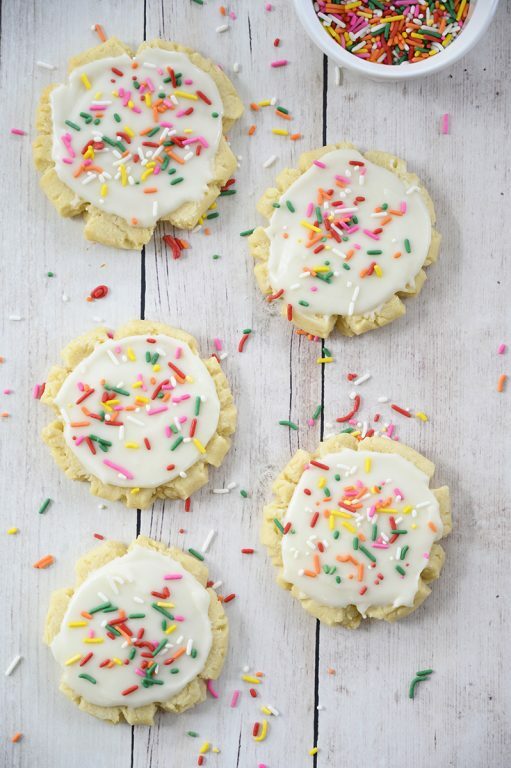 These swig sugar cookies are the best sugar cookies I have ever had…by far! Mr. Wishes is known to be a “constructive critic” when it comes to my cooking and baking. He could not stop eating these cookies. He actually went as far as to say that I should make these for the holidays from now on instead of my usual cut-out sugar cookies. He’s a little picky about his sweets so I took that as a ginormous compliment. They are seriously heavenly. If you are not familiar with swig cookies, they were made super famous at a bakery in a college town in St. George, Utah. Now, I have never been to Utah nor have I ever been to this bakery. I have only heard of the heavenly taste and it really seemed like I was missing out on an epic cookie. Recreating them at home was a must, obviously. I am 100% OK with making these in place of regular cut-out cookies where you have to chill the dough, roll it out, cut it out, and deal with a huge mess. They are so much work, am I right? These cookies just get pressed down, the edges look all cool and crinkly, and they bake up to perfection. They come out SO soft and just melt in your mouth, similar to my Lofthouse Sugar Cookies (but even better tasting). You can use any frosting recipe you like for these swig sugar cookies, but I think this recipe went very well with the cookies. The frosting is not too sweet or overpowering. Also, feel free to use any festive sprinkles depending on what holiday or special occasion you are making these cookies for! These swig sugar cookies are the real deal, guys. Try them soon. 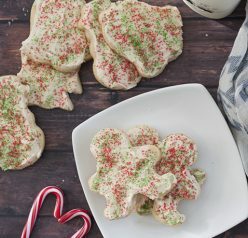 The best Copycat Frosted Swig Sugar Cookies recipe - no chilling dough, rolling out dough, or cutting out with cookie cutters! 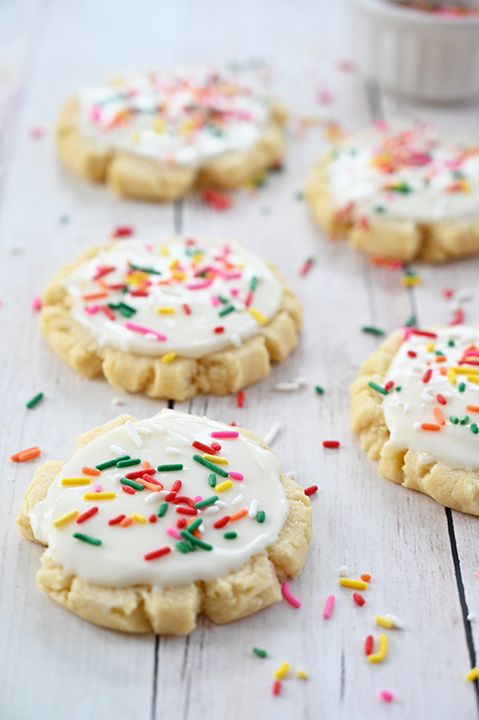 These frosted cookies are so soft, buttery, & so tasty! Line baking pans with silicone baking mat OR parchment paper. In the bowl of a stand mixer fitted with the paddle attachment (or in a bowl using a handheld electric mixer), add butter, oil, granulated sugar and powdered sugar. Sprinkle the baking soda, cream of tartar, and salt across the top of the sugars (this is very important, don't add all in a clump). Mix until combined and creamy, about 2 minutes, scraping down the sides of the bowl as needed. Add the sour cream (or Greek yogurt), eggs and vanilla and mix until well-combined, 1-2 minutes, scraping down the sides of the bowl if needed. Add the flour and mix until evenly combined; try not to overmix. Scoop the dough into about 3-tablespoon sized portions and roll into balls. Place several inches apart on the prepared baking sheets. 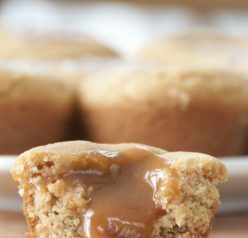 Add about ½ cup granulated sugar to a shallow dish or bowl. Lightly spray the bottom of a flat-bottomed glass with cooking spray and dip the bottom of the glass into the sugar. Press each cookie into an even thickness (about ¼-1/2 inch thick), dipping the bottom of the glass into the sugar between each press (don't keep spraying it with cooking spray). 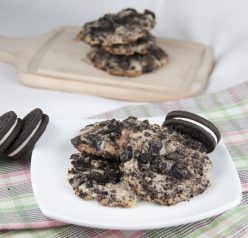 The edges of the cookie will "ruffle" out a bit and have crinkled edges like in the photos above. Bake the cookies for 11-12 minutes until just set. Don't let them get too golden - you want these cookies to be SOFT. Let the cookies cool for a few minutes on the baking sheets before removing to a cooling rack to finish cooling. In a mixing bowl (using handheld or stand mixer) combine butter, sour cream (or Greek yogurt) and vanilla. Mix until thick and smooth and creamy, 1-2 minutes. Add the powdered sugar and milk and mix until combined and creamy, scraping down the sides of the bowl if needed. Add additional milk, if needed, to adjust the consistency of the frosting. You want it thick but still soft and spreadable. 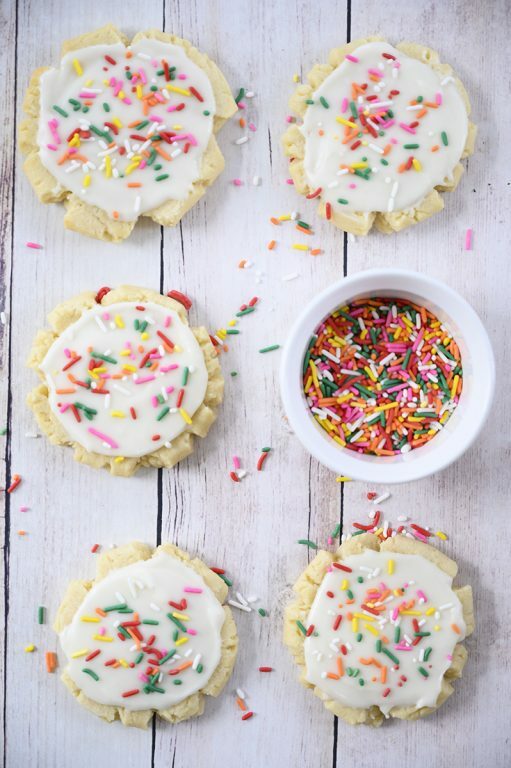 Frost the cooled cookies and decorate with sprinkles (optional). Enjoy! I need to copycat YOUR copycat and copy these. 🙂 Thanks! Thanks for sharing. Only change I did was to bake for 15 mins. Perhaps mine were thicker. these cookies look good ! What’s the calorie count ? ?